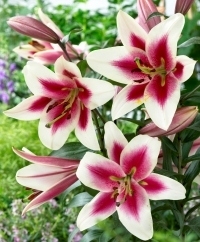 Our towering Dutch Orienpet Lilies add magnificent color, statuesque height and sweet fragrance to summer gardens. 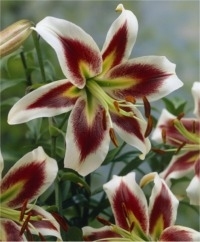 Also known as OTs and even Tree Lilies, Orienpets were created by crossing Chinese Trumpet Lilies with Oriental Lilies. Well-bred, they inherited the best of both parents, and then some. 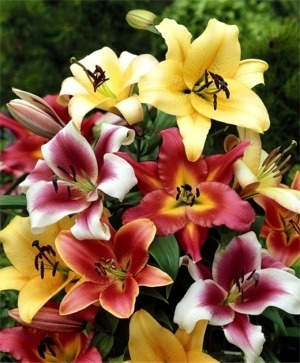 They have the stature and trumpet-shaped flowers of the Chinese Trumpet Lily, and the exotic beauty and fragrance of the Oriental Lily. 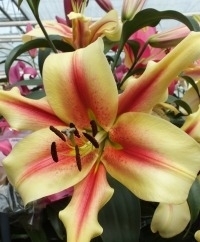 However, they are more disease-resistant and more drought-, cold- and heat-tolerant than either parent. They increase in height, flower size and flower count over time, are long-lasting and are drought-tolerant once established. 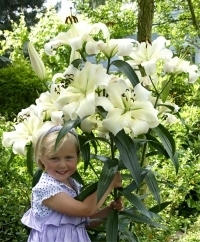 Some clients have reported that their Orienpets have grown to the size of small trees up to 8' tall, with dozens and dozens of ravishing flowers, each of which is up to 8" across. The huge trumpet-like flowers of the Orienpet have slightly recurved petals and a thick, waxy feel. 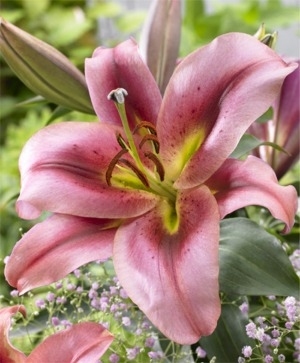 The imperious height and flower-laden, almost sapling-like stem of the Orienpet creates a huge center-stage show. 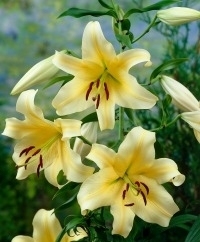 The substantive flowers are strong and long-lasting in the garden as well as in the vase. 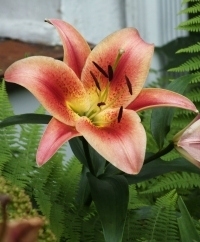 The best naturalizers, Orienpets are good from horticultural zones 4 through 8. 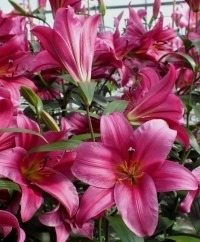 They bloom earlier than Orientals with a alluring, light fragrance reminiscent of raspberries and roses. 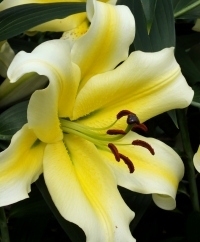 Among the last of the Dutch bulbs to be harvested, we ship Chinese Trumpet Lilies in mid to late October, just as soon as they arrive in our warehouse from the Netherlands. Lily Class: Orienpet. Bulb size: 14/16 cm. Plant 6" deep and 12" apart. July/August. HZ: 4-8. Height: 4' to 6'.